Commitments primarily focused on real estate and infrastructure. The Texas Teachers’ Retirement System (TRS) approved over $1.8 billion in commitments to more than a dozen strategies during December, a recently issued report from the pension revealed. A majority of the capital committed was allocated towards vehicles that primarily focus on real assets investments, such as infrastructure, real estate, and energy. However, private equity vehicles with large buyout strategies received some attention from the $154 billion investor. Sweden-based EQT received the most capital from TRS, clocking in $450 million across three strategies. 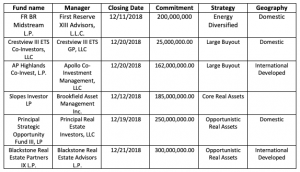 The new EQT Infrastructure IV fund, which is aspiring to raise about $9 billion in capital, received $200 million from TRS. Subsequently, two real estate strategies, EQT Real Estate II and a co-investment vehicle, received $100 million and $150 million, respectively. The investor also deposited a significant amount of capital into Alamo L.P., a separately managed account hosted by KKR that invests in several asset classes. The SMA received contributions for its infrastructure ($100 million), large buyout private equity ($225 million), and opportunistic real assets ($13.9 million) strategies. TRS is currently at 76.9% funded, and it is projected to take 31 years for TRS to reach 80% funded.